37 Cooks: Have a Happy National Daiquiri Day with ...Well, Just Take a Look at What Jennifer Did! over ice and shake. Serve in a rocks glass. This challenge happened to come up right at the peak of strawberry season here in Atlanta. 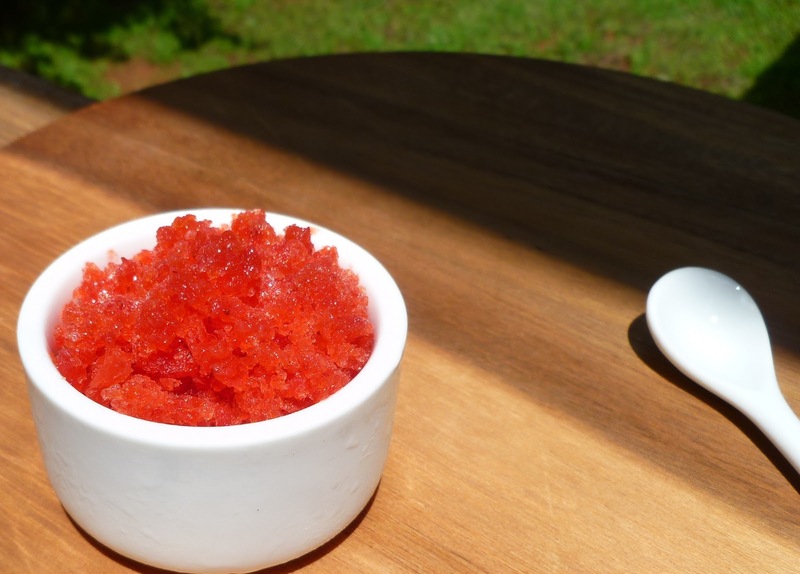 Rather than making the “traditional” (which I now realize should really be called the “modern” version - see my post on the Hemingway Daiquiri), I decided to make a Strawberry Granita. This would have all of the flavors of its well-known cousin, but in an icier form that would be served in a bowl in a smaller amount so as not to overwhelm with sweetness (unless you have a sweet tooth - then get yourself a bigger bowl). I chose dark rum, one of my favorites (it was also a favorite of my Dad’s - I guess I inherited it from him). And because this summertime treat is made with fresh strawberries, it’s practically health food, right? Combine the strawberries, ½ cup simple syrup, lime juice, and rum in a large cup. Blend with stick blender until smooth. Pour mixture into a shallow, freezer-proof container (I used an oval Corning Ware). Put into freezer and stir every 30 minutes until frozen through - when done, it will be a pan of flat red ice crystals. Stir before portioning into small serving dishes. Combine water and sugar in a small saucepan. Heat over medium heat until sugar is dissolved. Let cool. I’m not a huge fan of fruit salsas, and I really don’t eat mango, but for some reason I got it in my mind to make a sweet and spicy, rum-marinated mango salsa for this challenge. It took a few attempts to get the right balance because of the varying heat of the jalapenos I used. The ones I bought for the first batch were much spicier than the second batch, so you may have to play around with the amounts in the recipe to get it to your liking (I like it on the spicy side). Serving the salsa with blackened fish balanced out the sweetness of the mango, too. I was pleasantly surprised with the results. Give it a try, even if you don’t think you like fruit salsas - this one may change your mind! Place diced mango in a small bowl and cover with rum. Let soak for about 20 minutes. Drain off rum (reserve to make drinks with - the rum will have soaked up some good mango flavor!). Combine mango with remaining ingredients. Rinse rice with cold water. Place rice, salt, and coconut milk in rice maker. Add enough water to fill to the 1 cup line. Cook. When rice is finished, fluff with fork and stir in cilantro. Coat fish with blackened seasoning (flesh side only if using skin-on fish). Heat oil over high heat in cast iron pan (we did this outside on a propane burner). When oil is smoking, place fish, flesh-side down, into pan. Cook about 4 minutes per inch of fish on first side. Carefully turn fish and cook for about 5 minutes on skin side, or until cooked to desired temperature. I became a huge fan of popsicles after moving to Atlanta and discovering King of Pops. In the past, I could take or leave a popsicle, but the King of Pops goes beyond the traditional - they use seasonal, local, and/or organic ingredients when they can to make some amazing and unusual flavor combinations. So, I thought, why not make a “grown up” popsicle as part of the daiquiri challenge? The question then was, what flavor to make? I always have frozen bananas in my freezer. Both my husband and I like them “right before banana bread” as we like to call it, so the rest of the bunch inevitably gets thrown into the freezer, skin and all, usually to be used for breakfast smoothies. I had also just bought strawberries from one of our Farmer’s markets. Every year I buy a large volume when they’re in season, wash and hull them, put them on a jelly roll pan, freeze them, and store them in a freezer bag (again, mostly for smoothies). My frozen, needing to be used fruit made my decision easy - I decided to do a strawberry-banana daiquiri popsicle. I think that by freezing the banana and strawberry, the ice crystals help to break down the fruit and make it a smoother popsicle. I will warn you that these are a bit on the “boozy” side, but unless you make one GIANT popsicle and eat the whole thing, you’re not likely to get a popsicle hangover. Partially thaw the banana- this makes it much easier to peel! Place peeled banana, strawberries, and rum in a large measuring cup and blend with a stick blender until smooth (or use a regular blender). Place into popsicle molds, let freeze, and enjoy!